This dorling cartogram details the migration of Syrian refugees to European Union Member States, Schengen Area Member States, and Schengen Area Candidate States from 2008 to 2016. The relative size of each state is based on the total number of Syrian refugee asylum applications received. The color represents the proportion of asylum applications received relative to the total population. Manipulate the slider to view these attributes for different years, and hover over each cell for detailed statistics. According to the United Nations High Commissioner for Refugees (UNHCR), since the outbreak of the Syrian Civil War in March 2011, about 1 million Syrian refugees have requested asylum in Europe. 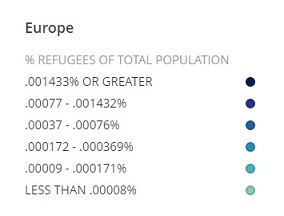 Yet, while Europe as a whole has undoubtedly served as a key hosting region for Syrian refugees, the contributions of individual states varies greatly. In fact, variance in support for refugees among states has led to significant domestic and international political tensions. The Syrian Civil War is an ongoing multi-sided conflict fought primary between the government of President Bashar al-Assad, along with its allies, and various forces opposing the government, including the Free Syrian Army, the majority-Kurdish Syrian Democratic Forces, Salafi jihadist groups, and the Islamic State. Throughout the conflict, numerous international organizations have accused the Syrian government, the Islamic State, and other rebel groups of severe human rights violations, which have undoubtedly influenced a major refugee crisis. While peace negotiations have occurred as recently as March 2017, the Syrian government and opposition forces have been unable to come to an agreement to resolve the war. As of 2016, the United Nations identified 13.5 million Syrians requiring humanitarian assistance. Of these, more than 6 million are internally displaced in Syria, and over 4.8 million have fled the country. Turkey, Lebanon, and Jordan have the largest populations of Syrian refugees. Nevertheless, the refugee crisis has become an enormous burden on Europe as well. Many states have struggled to efficiently process asylum applications, and the flood of refugees has exceeded the capacity of many states to provide aid. In April 2015, the European Union began increasing funding for border patrol operations, aiming to more closely monitor and police refugee migrations. In 2016, 7 countries reinstituted their own border control operations, including Germany, Hungary, Sweden, and Austria, who have received around two-thirds of the European Union's asylum applications. Even today, the refugee crisis remains a politically salient concern. In the most recent French presidential election, how to handle the crisis was one of the most central topics. Unfortunately, the future for Syrian asylum applicants in Europe is unclear. If the Syrian Civil War is prolonged, the number of refugees will surely grow. If refugee flows exceed the capacity to provide aid and support, one of the greatest humanitarian disasters ever may continue to worsen.